Diabetes and the Unexpected- Diabetes can sometimes seem to play by a rulebook that makes no sense, tossing out unexpected challenges at random. What are your best tips for being prepared when the unexpected happens? Or, take this topic another way and tell us about some good things diabetes has brought into your, or your loved one’s, life that you never could have expected? Elise has always had dinnertime issues. Even back when she was on shots, dinnertime was difficult. Her problem is this; give her all her dinnertime insulin in one bolus (no matter what she's eating), and she goes low. When she was on shots, as long as we gave her diluted insulin at dinner (u-50), it was fine. But now that she's on a pump, we have to just watch her CGM and bolus as needed. The hardest part is that it's not always the same. There are rare nights when she needs everything up front. Sometimes it only takes a few hours. And sometimes, it can take up to 5 hours to dole out her dinnertime insulin in little micro-boluses. And if I slip up and get distracted, it can get ugly. And yes, I have messed with I:C ratios, basals, and extended boluses. Nothing works. Except watching. And bolusing. We've been doing this as long as Elise has been on the pump. Unbeknownst to me up until a few years ago, this is actually a thing. It's called Sugar Surfing. 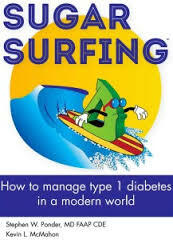 Dr. Stephen Ponder (a pediatric Endo, and T1) has written a great book about it, and also has a Sugar Surfing talk that he gives. Reading his book, and going to his talk (twice), has helped me fine-tune my evening sugar surfing. As an aside, Dr. Ponder is going to be at FFL this year! Make sure you check him out... his talk is engaging, funny, and full of great tips! I might even go for a three-peat! I may not have an answer to why Elise absorbs her food more slowly at dinnertime, but I am thankful that through some (or a lot) of trial and error, I've found something that somewhat works for us. And that seems to be how you do it with diabetes. Keep trying stuff until you figure it out. And learn to expect the unexpected. Aw, it's great you were able to find a resource that could help! And yeah just keep trying until you figure it out and then it will change again, diabetes doesn't play fair unfortunately. Dr. Ponder is the best. I have always been thankful for my kids time at camp with Dr. Ponder when we lived in Texas. Love the your line "keep trying stuff until you figure it out"
I'm reading his book now. Still lots to learn with diabetes - always... Hugs! I had no idea Dr. Ponder would be at FFL this year---that's huge! I am so glad you mentioned it. It really is exhausting. I'm glad you found what works! Glad you've found Sugar Surfing! I read the book earlier this year, finally learned the art of micro carbing to correct lows. I just met Stephen Ponder this passed weekend. It was the most useful workshop I've been to in YEARS!!! great posts!!! He's coming here to my Home town of Braintree, MA on Sept 9th. I swear by and am continually learning his techniques. HUGS!! !